Theo was born on the 22/09/2015, my pregnancy was pretty much uneventful apart from having spd through out the duration. Theo was my 3rd pregnancy, he has older brothers Harry and Charlie. It was a very rapid water birth but all seemed OK. He was born at 2:13am and we were home at 5:30am, our midwife came out that morning did all his checks, all was well. She noted he had single transverse Palmer creases on his hands but this alone in its self wasn’t an issue. So a few months passed and Theo was a perfect baby and a very sleepy baby, sleeping from 7pm til 7/8am and hours during the day. He was very content and as long as he was dry and fed he was happy. At 3 months he was still fairly floppy, we didn’t think much of it but relished the fact he was uber snugly and would fight over who would have cuddles with him. At his first injections/checkup is when our lives started to take a turn around, the doctor noted he had head lag and kept him on observation to check it again on his next lot of vaccinations. At this point the back of his head had become very flat, we were reassured it was plagiocephaly. At his next check his head lag had improved so he was taken off observation. Weeks passed and Theo was happy and cooing and we started to feel less worried. Then a health visitor visited us and told us she felt his head lag was still not where it should be and noted he had a flat profile and flat bridge nose with wide set eyes, so off we went to the doctors again where we were referred to a paediatrician, who said she was going to test for Down syndrome based on his soft dysmorphic features and poor muscle tone and developmental delay. This test took a week and and came back negative, doctors were pleased with Theo’s progress and they didnt seem too concerned, his liver enzyme tests came back raised so these were repeated and his very long chain fatty acids done as well as a whole load of other blood tests. This is where our nightmare began we were not prepared for a metabolic condition, so when we got called to meet with the metabolic specialist in Bristol we were immediately anxious, we were in Bristol hospital for 6 hours on the 11/04/16 and I can honestly say I can’t remember much of what was explained, just that they suspected Zellweger syndrome, but somewhere on a spectrum as Theo was doing so well it was unlikely he had the most severe form, so they needed to repeat the blood work for confirmation, this was a painfully long week wait where we now had the confirmation that he had Zellweger spectrum disorder. The days after his diagnoses were hard and it’s hard to grasp the raw reality that you will lose a child, it’s not how it should be! Not knowing what the future holds for Theo is pretty tough to handle at times. We had various doctors appointment from then on and Theo at 9 months is doing well, he is on a special diet but that’s it. He is still behind developmentally for his age but can now roll, and is getting stronger every day. His vision is unaffected and we are waiting to have his hearing checked. His liver is enlarged and his liver alt remains slightly elevated but an ultra sound shown all was fine at the moment. We are still waiting results of an mri at present. 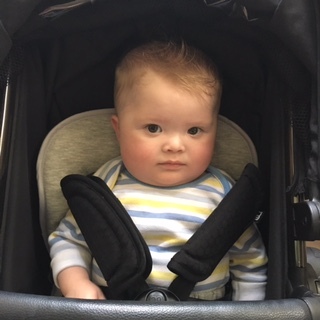 So this is Theo’s story to date and we appreciate at the moment he is healthy and doing well compared to others, so we are cherishing every day with him and making wonderful happy memories and hoping we have many many years with our beautiful baby boy.